Although he only visited Kenya twice in his life, US Senator and current Presidential candidate Barack Obama is half Kenyan, half American by descent. In Kenya, people are very proud that somebody whose father grew up herding goats, is climbing high in American politics. Ironically, as Obama’s father is from the Luo tribe, he would have a limited chance to reach the top in politics in Kenya. In his book “Dreams of my Father”, Obama – ful name Barack Hussein Obama Jr. – describes his family background. Obama was born in Honolulu, Hawaii, of a Kenyan father with the same name, and an American mother, Ann Dunham of Wichita, Kansas. His father, Barack Hussein Obama Sr., and his grandfather were poor. They lived in a little village in Kenya's western Nyanza province. His grandfather was a cook for the British, who were the colonizers in Kenya at that time. His father “grew up herding goats and went to school in a tin-roof shack”, as Obama said himself. But the father was hard-working and ambitious. He got the chance of his lifetime when he got a scholarship introduced by John F. Kennedy to study in the USA. He enrolled in the University of Hawaii, where he met and married Obama’s mother, fellow student Ann Dunham. She came from a blue-collar background too. Afterwards, he studied at Harvard University. The marriage, during which Obama was born, lasted only a few years. After a few years, she married Lolo Soetoro, an Indonesian oil manager and they moved with Obama to Jakarta. Obama’s father went back to Kenya where he worked in the oil industry and eventually became an economist in the government of Jomo Kenyatta, the first Kenyan President after independence. He died at age 46 in a car accident. One story holds that Obama Barack still is a Muslim, as many in the East of Kenya are. That isn’t true. His grandfather converted from Christianity to Islam after having fought for the British in World War I and having traveled to Islamic Zanzibar. After this, he added Hussein to his name. As a consequence, Obama’s father was raised a Muslim, but he became an atheist long before he met Obama’s mother, who was not religious as well. The same goes for his mother’s second husband – Obama’s step father. But both Obama’s first and middle name have an African-Arabic origin. Barack means “blessed” in Arab (which has influenced East-African languages a lot during the ages) and the Arab name Hussein was passed from his grandfather and father. Barack Obama himself became a Christian, as well as his wife Michelle. He joined the Trinity United Church of Christ in Chicago in 1988. But political opponents continue to circulate rumors that he’s really secretly a Muslim. The Hillary Clinton camp played into this by circulating a photo (above) of Obama in African Somali clothes during his trip to Kenya and neighbouring countries. However, this seems to have been nothing else than Obama being a respectful visitor and trying on the clothes that he got as a present. 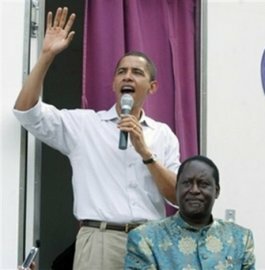 Obama visited Kenya only twice in his life. The first time was before he, like his father, entered Harvard University. He visited his relatives in the Nyanza province, and cried at his fathers grave, even though he hardly knew him. The second time, in 2006, it was an official visit as US Senator. With his wife and 2 daughters, he was received at Jomo Kenyatta International Airport by the US Ambassador, Michael Rannesberger, and Obama’s Kenyan relatives. The streets were lined with massive crowds hoping to catch a glimpse of the currently only black US Senator. A spirit of Obama mania swept the nation, with Kenyans even renaming a local beer to “Obama”. He also visited his 85-year old grandmother in her little village of Nyangoma-Kogelo, where chicken roam free. She didn’t buy a new dress for the occasion, saying that Obama would hug her anyway. She cooked a traditional Luo meal for him with eggs, vegetables and ugali. They spoke through an interpreter, as she doesn’t speak English. Obama gained a lot of attention through his very well received keynote address at the Democratic Convention in 2004. In his address, he mixed elements of his personal story with a vision for an America with opportunities for all. “In no other country on earth, is my story even possible”, he said, pointing to the fact he as the son of a poor black immigrant made it to the US Senate. There is a bigger irony in that. In Kenya, the Kikuyus are the ruling tribe and for a Luo, like Obama, it’s very hard to become president. Many Kikuyu claim that “they” paved the way for Kenyan independence in 1963 – even though many Kikuyu who talk that way weren’t even born in 1963. The Luo don’t practice male circumcision and the Kikuyu and several other tribes believe that any real man must be circumcised. Therefore, a Luo cannot be a real man and cannot be President. In fact, the election violence in Kenya of was exactly about this: the sitting president Kibaki, a Kikuyu, defending the primacy of his tribe against Raily Odinga, a Luo, and his supporters who were angry that they were marginalized for so long. So in Kenya, the joke is now going round that it’s easier for a Luo to become President in the United States than in Kenya. 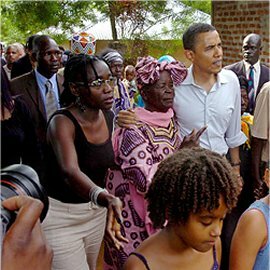 Sign Up And Get The Free Photo Essay "Barack Obama's Kenyan Roots"
If you subscribe to my e-ezine here, you'll get a password for the Subscribers Area where you can download a photo essay about the Kenyan roots of Barack Obama. View these images and see for yourself where the possible next US President is coming from!